The first I heard about 3D printing was when I read The Pirates Dilemma a few years ago. Now when I see something that has been 3D printed it makes me think back to it. If you’ve not come across the book, it’s an interesting read about youth culture, piracy and the challenges that businesses face dealing with piracy. In the book, 3D printing is shown as a possible way we could buy things online in the future to print off at home on our own 3D printers. Although we may not be at that point just yet, it is possible to buy 3D printed objects online and have them delivered. 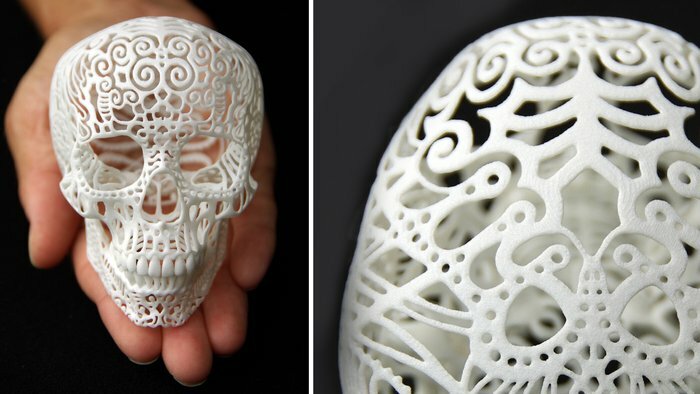 I can’t take credit for finding this beautiful 3D printed filigree skull, I found it over on The Skull Illusion, where Violet Fenn collates post-mortem photographs from times gone by. The photographs are particularly from Victorian times, photography was so expensive that people often wouldn’t have any pictures of their loved ones and would take a photograph in death to preserve their memory. Violet describes her site like Marmite, in that people love it or hate it. Although I can’t stand Marmite, I think her site is incredibly interesting and touching. The stunning Crania Anatomica Filigre is designed by fine artist Joshua Harker on paper and printed from a 3D printer. It is available in his online store in mini, small, medium and large from $50-$375 and in a choice of eight colours. I love the design and am hankering after a white one. Which colour would you get? and printing trainers. Incredible. Good book. I literally just saw this piece on pinterest. I think its beautiful, and shows what’s possible with 3D printing. My fiance and I bought a 3D printer last year called the “makerbot thing-o-matic”. One of my favorite parts was just putting the makerbot together. When we bought it, it was in hundreds of pieces. Wow, I didn’t know you could buy them for home use. What a fabulous name too!